Clustered into 26 atolls, three hundred and fifty thousand people live on the small scattered islands in the Indian Ocean known as the Maldives, spread over an archipelago stretching nine hundred kilometers from North to South. The Maldives are viewed as a paradise on earth, but their existence is threatened by rising sea levels and violent storms. They were badly damaged by the Tsunami of 2004, with 83 lives lost and a 50% drop in tourists. The rebuilding has started but the distances between islands are huge, greatly slowing the efforts of the British Red Cross and other agencies. After one year, some 800 had been repaired, with over 2,000 still needing to be completely rebuilt. In 2006, five new island resorts are due to open and it's predicted that tourism in the Maldives will reach an all time high. Only time will tell what the long-term social and political impact of the Tsunami will be on the Maldives. 2. School's Out! - Is the private school option better in a Lagos shantytown? 11. Back In Business? - After 11 years of civil war, can Sierra Leone expect tourism to improve the economy?. "The visual impact of the gripping documentaries in the Life 5 series make them extremely powerful teaching tools for university, and indeed, other classrooms. In succinct episodes they raise and contextualise some of the most critical issues in the world today. These episodes are produced in an extremely objective manner and allow an audience easily to come to grips with an array of complex problems. They ought to be an indispensable part of the teaching curriculum." "[Trouble in Paradise] highlights the need for greater communication and the importance of keeping people informed of what is being done. It also highlights psychological issues faced by the people and the resulting effect on communities...This film can be recommended for junior high through adult audiences. 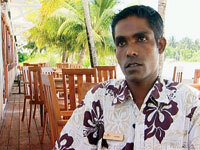 It is very well done with very clear narrative and breathtaking views of the beautiful country of Maldives."